Your thumb can say quite a bit about relationships and how you interact with your loved ones. If you find yourself curious about a potential mate, all you need to do is take a look at their thumbs to see if your personalities will match well. The human thumb is an evolutionary advantage; it is opposable, unlike the other hand digits, and only has two distinct phalanges (bones that make up the fingers). All of the other fingers on the human hand have three. For centuries, palmists have used the length, flexibility, and shape of the thumb to determine how a person interacts with others. Those who practice palmistry will say that that the length of the thumb can indicate how faithful a partner will be, how flexible or closed-minded he or she will be, and their level of generosity. As a rule, palmists maintain that the longer a person’s thumb, the more faithful they will be, and the more flexible the thumb, the more open-minded and tactful the person will be. Thumb shape plays an important role as well: more delicate thumbs denote a more sensitive personality, while a short, clubbed thumb can indicate a stronger- even brutal- personality However; there has been closer study of three distinct types of thumbs, and each type’s general personality traits. In type A, the first part of the thumb is longer than the second one. People with this thumb type are incredibly passionate. They may also tend to become obsessed with their partners. Any person dating this type needs to be prepared for some serious devotion! If you have this thumb type, make sure that you do not become too dependent on your partner for happiness. 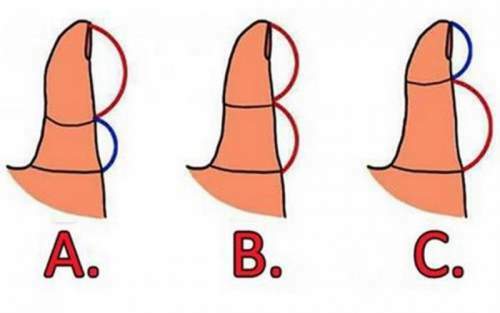 A “Type B” thumb has an equal top and bottom half. Those with this thumb type are balanced and calm. They do not fly off the handle, and they carefully plan out every move they make. If you have this thumb type, you may have noticed that, since you take things slowly, you come off as disinterested in a partner. If you are currently dating someone with this type of thumb and they appear aloof, never fear! They may just be taking their time to get to know you better. Type C is the most restrained personality type. Those with a thumb type in which the bottom half is longer than the first are known for holding back emotions. They are very observant about the world around them and do not trust people easily. If you have this thumb type, you may even have lost out on quite a few relationships because you’ve never told a potential mate how you feel about them! So the next time you are on a date with a new special someone, take a look at their thumb and yours to check compatibility. If you find yourself unlucky in love, take a look at your thumb type and ask yourself how to best use your unique personality strengths to find a great person to spend your life with.